Reasons for the enemy wanting ever stricter bail conditions became clearer last Wednesday. First imposed December 2016 by Friend of Israel DJ Emma Arbuthnot (recused), I have now been on bail for 15 months. Last autumn’s Freedom of Informationrequest provides ample confirmation of Crown witness and CAA EnforcerSteve Silverman‘s determined efforts to have me locked up for breach of bail, thus obtaining a police interview which could be used against me in court. Much of the questioning in fact centred on my answers to Sgt Jon Lloyd regards my song Too Extreme For The BNP for which no charges have been brought. I think on the whole press coverage was pretty fair: selective in parts, for sure, but Jenni Frazer actually manages to call me a performer – a giant step forward. Hurrah! Left: Barrister Adrian Davies and Alison Chabloz leaving court. Photo Colin Bex. The BBC’s Martin Bashir takes a similar angle. Note the use of ‘Jewish people’ in the title. Have the Beeb’s headline writers been issued with an order not to use ‘Jews’? Do other BBC headlines speak of Muslim or Christian or atheist ‘people’? Last but not least, the Blackpool Gazette used the PA‘s report. Would the fact that my IP address is now blocked by the Gazette have anything to do with my previous satirical blogpost which features the seaside town? Was someone offended? Other articles have been released in the alternative media. As many of these link to my videos and several have reproduced my song lyrics, I am unable to share for fear of hurting someone’s feelings and once again finding myself behind bars. Ditto regards my appearances on three alternative radio podcasts, The Daily Nationalist, Down The Rabbit Hole and The Graham Hart Show. For those with time and inclination to listen, any search engine is your friend. Many thanks to all those supporters who turned up last Wednesday. Apologies to those of you who sent messages and who have not yet received any reply. After being filleted and grilled by the opposition in a public court, my energy levels are somewhat depleted: in the days leading up to this latest court appearance, media hounding of my immediate family as well as criticism within revisionist ranks from ‘supporters’, resulted in an emotional battering from which I am only just recovering. For the record, Dr Fredrick Töben has published a full account in the latest edition of his Adelaide Institute newsletter. Again, a search engine will do the necessary for those interested. “Alison, you make many good points, in particular: blatantly anti-Christian songs are completely allowed, while you are merely trying to help people realize how we’ve been lied to about a historical event involving this powerful sect who has basically controlled the narrative. Finally, a HUGE thank you to JQ Rowling on Gab who has created the most wonderful meme. As with alternative media articles and podcasts, I am unable to share here on my blog. Only those receiving this missive via email may rejoice in its fabulousness! 3. Judge Zani will reserve his judgement. 4. A further hearing will be held on 25th May at which Zani will give his verdict and the reasons for it. 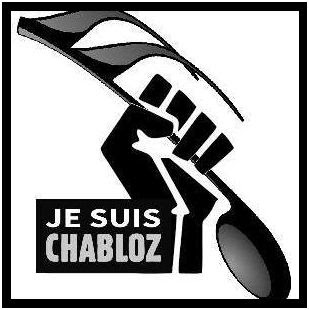 There were around 20 supporters of Ms Chabloz. There were a number of interruptions from the public gallery in support of Ms Chabloz . These annoyed the judge enough to make him threaten to clear the public gallery. Compared with the first day’s hearing on 10 January there was little media interest, although Martin Bashir sat in the press section. During one of several adjournments he engaged in an extended conversation with prosecuting counsel Karen Robinson.